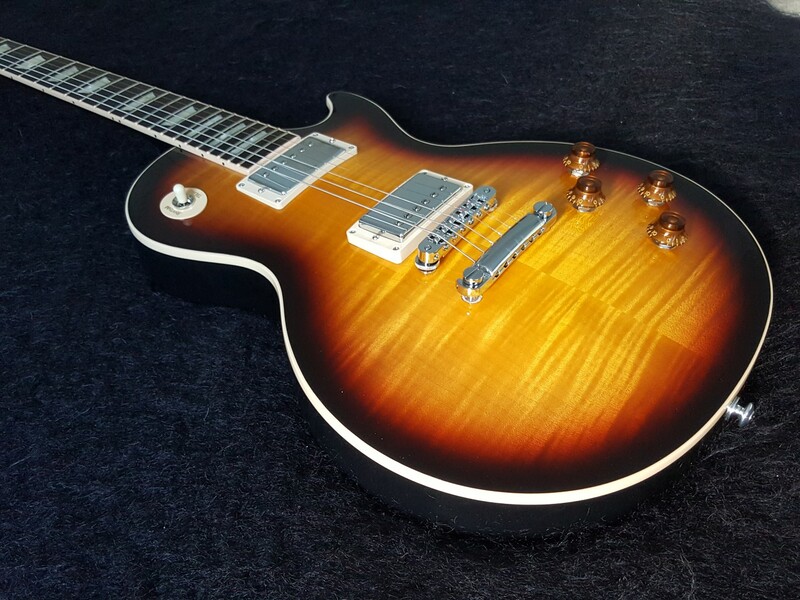 Gibson Les Paul Standard 2016 T-Fire Burst Electric Guitar with Mahogany Body, Maple Top, Mahogany Neck, Rosewood Fretboard, and 2 Humbucking Pickups. Brand new, un-played, not been a demo. On the stage or in the studio, you can't beat the Gibson Les Paul Standard solidbody electric guitar for iconic vintage tone with uncompromising playability. You'll love the Les Paul Standard's premium features, like the Modern weight-relieved body that's lighter in weight but still packs ample sustain. The mahogany neck sports the '60s neck profile for fast and fluid fretwork, and the compound-radius rosewood fretboard makes the Les Paul Standard perfect for both rhythm and lead roles. The Les Paul Standard features a 10"-16" compound-radius fretboard for ultimate playability. The fingerboard is rounder near the nut for easy chord grabbing and rhythm playing. As your playing heats up and moves up the fretboard, the radius flattens out for easier runs and big, big string bends. With a neck that plays this slick, you'll be up at the highest frets before you know it. Nothing beats the sound of the Les Paul Standard's Burstbucker pickups. You'll love the tight low end, complex midrange, and sweet highs you'll get out of these pickups. And for more tonal flexibility than ever, the Les Paul Standard sports coil tapping electronics that let you select from single-coil or humbucking tones - even reverse the phase of the neck pickup for more mojo.